The Splash Pad is in the Family Aquatic Center at Sevierville City Park. Splash pad is for kids of all ages! The Family Aquatic Center is a great place for your family to spend a few hours or all day during those hot summer months. Complete with a concession area full of yummy snacks and treats, thereâ€™s no need to pack a lunch! For more information on the Sevierville Family Aquatic Center or for group reservations, please call 865-453-5441 or 865-429-1504. 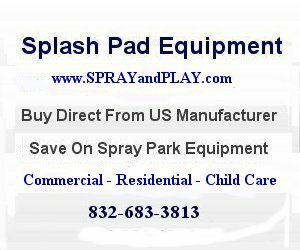 This entry was posted in Tennessee and tagged Sevierville, Sevierville City Park, splash pad, splash park, spray park, Tennessee, waterplay. Bookmark the permalink.